Wax Free Toilet Seal - No-Wax Replacement! If you’re installing a new toilet or fixing a rocking toilet or a bowl that was leaking from the bottom, you’re going to have to replace the wax ring seal. It’s just the way it is. 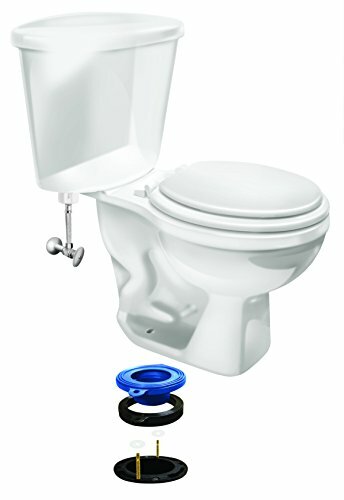 This all-important seal is what keeps water from leaking between the base of your bowl and the trap, the larger pipe below your porcelain throne that carries waste water away. If you’ve never replaced a wax seal or have never seen an old one, you might be surprised at how a toilet’s wax ring does its job. Basically, it’s a circle of wax that is of course modable under pressure. When it gets pressed down from the weight of the toilet (as it gets set into place) it will conform to the shape of the toilet base. When it gets all smashed down in there, a water tight seal has been created. This is how toilets have been installed for decades. Millions and millions of toilets around the world have been sealed using a waxy material. There are problems with this approach though. The obvious one is that they can only be used once. As soon as you lift your toilet away, that pressurized bond is no longer there, and the seal will let water through. Other issues are age-related, because simply put, nothing lasts forever…including a nifty waxy seal. What you find out is that no matter the cause, the symptom is always the same – leaking water at the base of your toilet. Thankfully there are ways to deal with whatever the problems are. They even involve going wax free, which comes with some long term advantages. Read on to learn more. We all know what happens when a wax seal fails…breaking apart and giving way…You guessed it, water comes out from under the toilet. Even when you’re not using it, water can leak out. The leak can be big or small. In fact, a slightly broken seal can leak out a little bit at a time, leading to rotting floorboards and much worse. The issue lies in the fact that the wax ring might be deteriorating – they simply don’t last forever. When it breaks, it’s time to replace it fast. If the toilet flange ever comes loose and the toilet rocks, the wax seal can be compromised. Remember, it adjusts its shape to the movement of the heavy toilet bowl. That bowl should be completely stationary to maintain the shape (and seal!) of the wax ring. Aside from wax ring seals being so seemingly fragile, they are just plain messy. If you’ve ever lifted an old toilet off or replaced a seal before you know what a gunky mess is waiting for you under the toilet. The seal sits on top of the toilet flange (that’s bolted to the floor) and the toilet base or horn itself. Sound like fun, cleaning that off when you insert a new seal? Not so much. So, if wax seals are so sensitive and messy, what is the alternative? Read below to learn about wax free toilet rings – why they are better and how to install one in your bathroom. Note, if you have a non-standard toilet drain pipe such as in an older house, a wax seal still may be best – consult a plumber first. Now that you know how a wax ring works, you’ll quickly understand how a wax free bowl gasket works…better. It does the same thing, but the difference is that the seal uses adhesive to “glue” itself to the base of the toilet, and the sealant part is made of rubber. 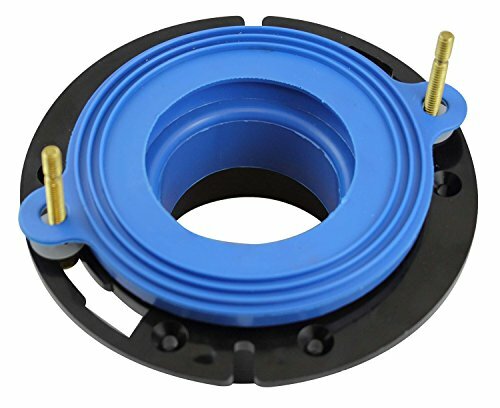 This secure hold allows the toilet to be placed over the flange and drain pipe and set in place for a permanent seal – or at least until you buy a new toilet, whereby you’d have to put on a new seal no matter way. Two popular manufacturers, FluidMaster and Leakno make wax free seals. The FluidMaster product seems to be more tested in the market so you’re probably safe with them. These wax free seals also work great for raised floors, such as the addition of a hardwood floor in a bathroom. So, there is no wax and no guessing whether the wax ring is really doing its job. Of course, this is true with any toilet gasket, but waxless gaskets are indeed easier. If for some reason, you’re toilet bolts become loose, and the toilet moves, you have much less of a chance of damaging the seal, unlike the wax kind. Lastly, it’s so much cleaner. Just ask someone who has improperly installed a wax seal, only to have to remove it and clean it all out before putting in a new one. The beginning steps for this process assume you know how to remove your toilet, i.e. turn off the water supply behind the bowl and flush out the water before unbolting the two flange bolts and removing them. Using a helper, or a proper lifting posture, carefully lift up the toilet. For the last time (at least with this toilet! ), you’ll need to clean off the old wax seal. You can start with a small putty knife, or any tool that can dig out the bulk of the wax. Don’t use paper towels (they tear and get caught on the flange edges) – use a heavy cloth rag instead. Using a hair dryer can help warm up older or crusted wax, so it’s easier to wipe up. Use your favorite household cleaner on your rag to wipe up every last waxy substance. Windex can work well, or if you really want to go the extra mile, try a little WD40 as a solvent. Don’t forget to clean both the flange on the floor (if not replacing) and the base of the toilet (horn) for a clean surface for the waxless seal’s adhesive to stick to. When all is clean, you’re ready to apply your new wax free seal. Since size matters, be sure to measure your drain pipe hole. They will sell them in slightly different sizes such as 3″ or 4″ (see right photo and link). If you’re really not sure, pick up a couple different sizes to be sure since they’re only a few bucks each and are easy enough to return…even at Amazon.